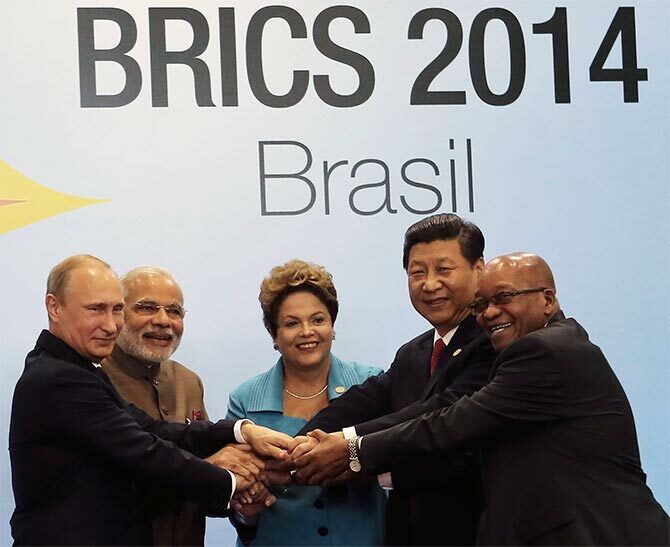 Borrowing from BRICS bank will help India avoid other kinds of politics emanating from the West. Overall, the BRICS institutions will necessarily adopt alternative ways of doing things based on their own cultural and socio economic needs, says M K Venu. The BRICS bank with an authorised capital of $100 billion (about Rs 600,000 crore) as well as a separate contingency reserve arrangement of $100 billion, created jointly by Brazil, Russia, India, China and South Africa, could mark a profound shift in the way global finance and politics might operate in the years ahead. The World Bank and International Monetary Fund, formed after World War II, served to create a philosophical framework within which the global political economy was shaped for many decades. These agencies did not quite recognise or understand the cultural factors which were deeply embedded in the social and economic behaviour of the Third World. This is admitted by many scholars now. The BRICS financial institutions will necessarily have to create a different kind of economic and political consensus among the developing societies, transcending past ideological categories. This will be the biggest challenge for the BRICS financial institutions. The BRICS bank, like the World Bank, is expected to fund much needed physical and social infrastructure in the BRICS countries. The contingency reserve arrangement will act like the IMF, which provides temporary bail-out funds to economies facing capital flight and currency crisis. Of course, the IMF also follows a political agenda, such as showing excess generosity to Russia in the early 1990s when it broke away from Communist Soviet Union. BRICS contingency reserve is not expected to display such overt biases! The BRICS bank could, at a later stage, invite other emerging economies also to become shareholders and widen the ambit of its operations to much of the developing world. South Africa already wants the benefit of a BRICS bank to reach other African countries. Similarly Latin American nations like Mexico and a few others also want to be part of the BRICS story. In short, BRICS has fired the imagination of the people in a way no other global grouping has in recent times. Though western commentators pooh-poohed the idea of BRICS bank and contingency reserve as a pie in the sky, they are all surprised at the speed with which these institutions have been launched. It appears that expert observers have not been able to grasp the spirit of the times. The main criticism levelled by sceptics is that the BRICS nations are too disparate to be able to come together in any meaningful way. Actually what makes BRICS really meaningful is the presence of China and India, the two most populous nations in the world, who will really decide the nature and trajectory of world growth in the next 30 to 40 years. This is so logical as to not require even a debate. So if China and India are critical to how the world economy shapes up in the coming decades, it stands to reason that BRICS could play a role in driving a consensus around issues like climate change, nature of future consumption, world trade and use of appropriate technology etc. This will become even more potent when other developing countries rally around BRICS whose nations are already playing a key role as a pressure group on the sidelines of the World Trade Organisation and climate change negotiations. A top Prime Minister’s Office official told me some time ago that the BRICS bank has particular relevance for economic cooperation between India and China. He argued that the Indian establishment was still hesitant to directly deal with China because of the legacy of past suspicion and bitterness between the two nations. However, such business interaction can be pushed through financial institutions like the BRICS bank. For instance, if there is a temporary attack on the Indian currency, it can now take the help of the reserve fund in which China has 40 per cent contribution. In normal circumstances, the Indian establishment may feel constrained to directly seek help from China. A more robust engagement between India and China could occur via these new platforms. Also, even as the BRICS financial institutions eventually expand their catchment area to other developing economies, they will at the core serve as a conduit of meaningful interaction between India and China. This is a less appreciated aspect of BRICS. So critics who talk about the disparate nature of BRICS countries fail to see how it brings India and China much closer, which by itself can have a profound impact on South-South cooperation. One of the big benefits that flowed to Indian industry from the BRICS deliberation was after the New Delhi summit where it was decided that BRICS economies can do trade in their local currencies instead of dollars. After that the Indian government allowed domestic infrastructure companies to borrow yuan-denominated loans from Chinese banks to pay for massive import of power equipment from China. At least 25 per cent of our power generation capacity over the next decade is based on Chinese equipment import. This means roughly $30 billion (about Rs 180,000 crore) of power equipment could be imported from China. The BRICS bank could also offer cheaper loans for such power projects in BRICS countries. Borrowing from BRICS bank will help India avoid other kinds of politics emanating from the West. For instance, the United States is clearly discouraging the World Bank from lending to coal-based power projects in the populous developing world. India will be dependent on coal-based power for 50 per cent of its electricity consumption over the next few decades. China's position is similar to that of India's. So the BRICS bank can chart a course different from that of the World Bank in this respect. Overall, the BRICS institutions will necessarily adopt alternative ways of doing things based on their own cultural and socio economic needs. What did BRICS build (if anything, in Brazil)? What is the purpose of the BRICS Bank?